Math Tables Karaoke for iPhone review. Not all kids love to learn mathematics, even when I was a kid, I never liked to study maths and memorizing all the tables. But those time has changed. The current world has lots of interactive classes to learn maths in an easy way and one such is Math Tables Karaoke iPhone app, which brings learning math tables more simple and interactive. The app was developed by Rega Interactive who was previously known for their World Jam 2 iPhone app. 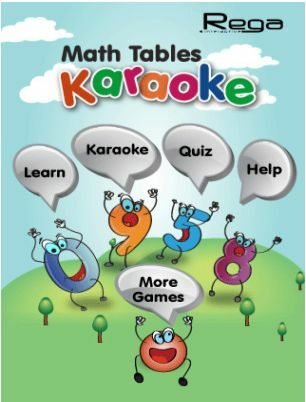 Math Tables Karaoke is an educational app, that was build with in an interactive to learn math tables. The app is about learning math tables using three different modes – Learn, Karaoke, Quiz. If you take a look into all the three modes, each modes has an interactive option to learn math tables. While checking out the Math Tables Karaoke app for iPhone, ipod touch or ipad, I went the around the option Quiz and tapped on it. The quiz mode has three levels of difficulty to train up kids in math tables. Each levels has 60 seconds time to complete as many attempts possible within the defined time. So based upon the no of right answers the app grades a level. Looks to be a very nice idea to kids to learn math tables. The app also features “Learn mode” where we get math tables from 1 to 10 along with voice. The voice clarity is good with proper break time to let the kids say the tables. It like a teacher who teaches math tables to a kid. Well, parents are going to get the maximum benefit of this application and its an easy way to let their kid learn math tables in a interactive way. The “Help” section has the instructions on the purpose of the three modes and “More games” get you the list of apps developed by Rega Interactive. Nothing much to talk about Math Tables Karaoke iPhone App, overall its a simple app developed to make learning simpler. Get this great math tables karaoke app for iPhone Here!